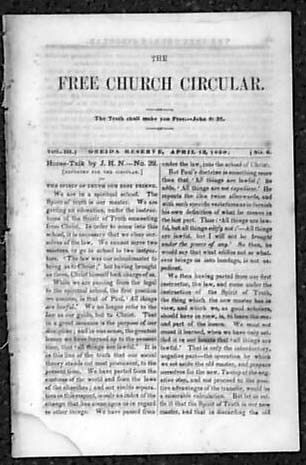 Item # 153252 THE FREE CHURCH CIRCULAR, Oneida Reserve, 1850 A periodical from the Oneida Community published by George Noyes. Note that the photo is "generic" and the issue you get will not have this specific date but will have the format as shown. Measures approximately 9x6 inches and contains 16 pages.